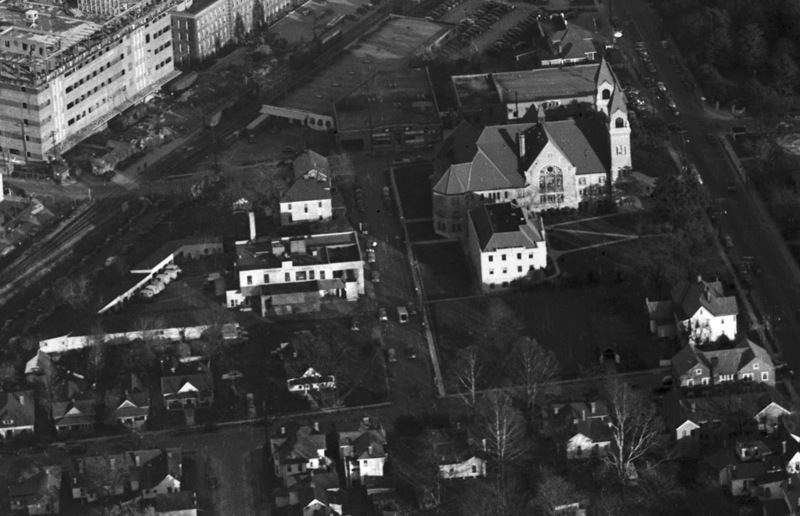 As a child (late 60's) we would go to the Dairy Bar at Durham Dairy Products after Church at Duke Memorial and get ice cream. So shocked that it's now a church parking lot! It looks like it was expanded (the rear was raised to two stories) between the two photos. It's interesting that one of these shots shows the Chesterfield building being constructed next to an intact (4-story) Old Cigarette Factory. One of the primary reasons that the National Park Service gave in denying BDV's proposal to rebuild the top two stories of OCF was that this situation never existed. Do you know if OCF was lowered simultaneously with construction of Chesterfield? Nice pickup, Rob. I've been meaning to go back and add these aerial shots to my New and Old Cigarette Factory posts. I also have another shot taken from the NCF looking east into downtown - with an intact OCF. I think the answer to your question is no - not simultaneously. I haven't seen a side-by-side, clearly completed NCF and intact OCF, so I would imagine it didn't stay that way for long. I remember so well in the late 60's and early 70's going to the Durham Dairy on Wednesday afternoons after school and before choir practice for ice cream. I loved sitting at the counter, spinning on the stools while eating ice cream with my friends. Those were the days. We would park, go in to the counter and then return to the car with our ice cream. After my Father finished his, we would then drive around Durham while the rest of us finished our ice cream. I had no idea as a young child that the reason we took that ice cream to the car was because the Durham Dairy was segregated and being an African American family, we were not allowed to eat our ice cream on the premises. I was shocked to learn as an adult how my parents had been so artful in sparing this ugly truth from me and my younger siblings. Apparently, my older siblings knew. Regardless of this not so wonderful part of its history, the Durham Dairy provides fond memories of family time spent together. I just found a little half pint bottle that has "Durham Dairy Products, Inc." etched on it. Pretty cool. My house was built in 1927; who knows what year it could have been from. I'll keep it since it's so unique. 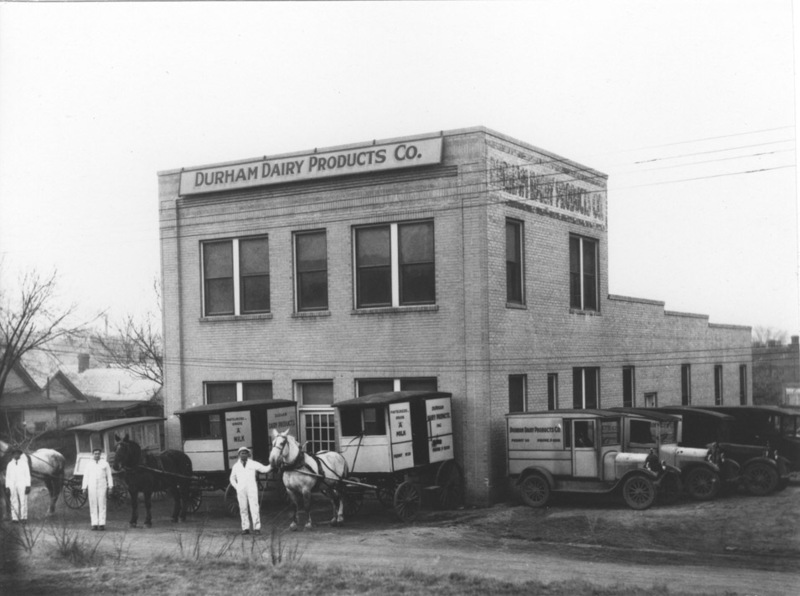 "Durham's era of modern dairy service started January 10, 1927, when Durham Dairy products made its first delivery. Almost overnight the community began a march of dairy progress which today rates as 'outstanding' in the South." I'm not sure how one defines "dairy progress" (milk -> yogurt?) but you can get a sense that milk delivery was a big deal - and why not? Someone showing up at your doorstep in the city with fresh milk for the morning? What a modern convenience for city folk. 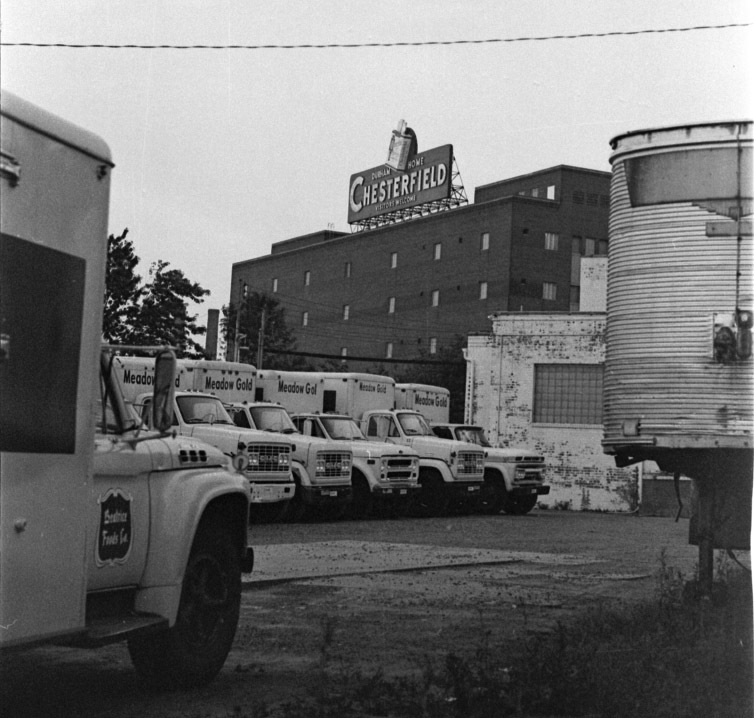 Looking east, 1948, at Durham Dairy on Memorial Street, with milk trucks parked at the back of the lot. The book goes on to note that Durham had been pining for "dairy service" and the Chamber of Commerce casting about to try to find some "experienced dairymen". Through the recruiting efforts of ET Rollins (of the Herald Sun) and RE Dillard ("agriculture leader") they were able to recruit CB Martin and VJ Ashbaugh, both graduates of the dairy school at Cornell University. 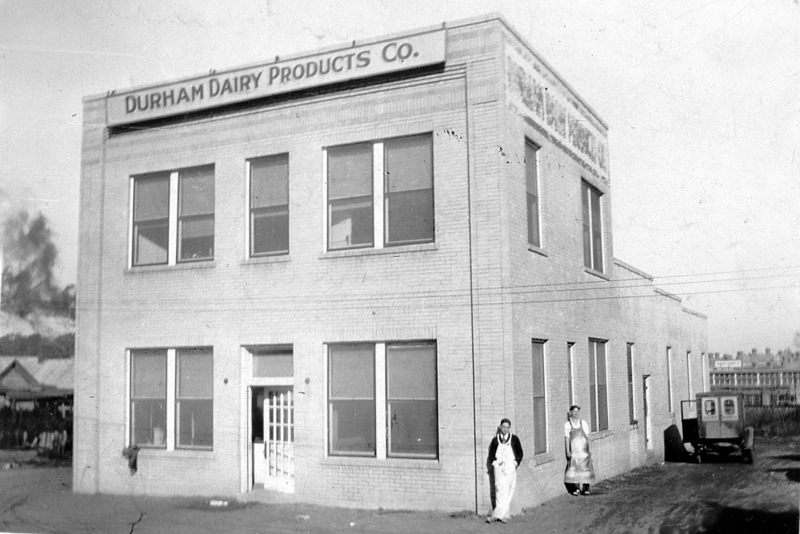 Durham Dairy appears to have kept going strong into the 1960s, and the building, at least, was still around in 1964. However, milk delivery had started to decline with changing shopping patterns and the rise of supermarkets, widespread car use, etc.